The recordings were originally published on vinyl as part of the Stanley Schofield TT Sound Stories collection. Duke is delighted to be able to offer fans old and new these exceptional recordings in one handsome collection. 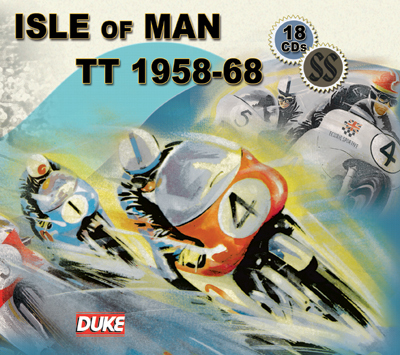 With 837 minutes of motorcycling audio history presented on 18 CDs, this is both uniquely collectable and great value. The recordings have been lovingly restored, using the latest digital technology, and each year is presented with a reproduction of the original LP sleeve notes. This box set features coverage of racing from 1958-68, featuring Hailwood, Agostini, Redman, McIntyre, Surtees and more, with commentary from Graham Walker, Murray Walker and Peter Arnold, plus plenty of fascinating interviews. However, it is the exhaust notes of the Hondas, MVs, Nortons, AJSs, Gileras and many other classic machines which make these CDs so magical.